ANNVILLE, Pa. – Former Lebanon Valley football player Brett Keller '06 remains close to the game he played for four years as a Flying Dutchman. 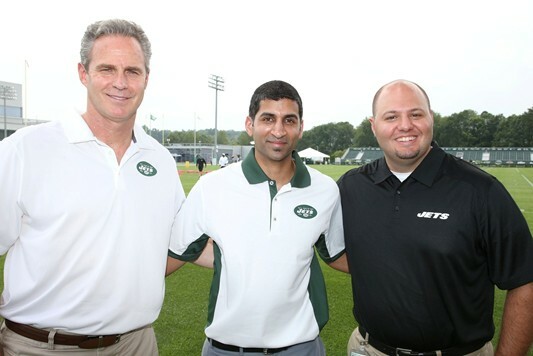 Now, however, he mans the sidelines at MetLife Stadium as a Sports Medicine Fellow for Atlantic Sports Health, working in particular with the New York Jets. The former LVC offensive lineman and linebacker has been working as a member of the field in the years since his graduation. Now, he's living out this once-in-a-lifetime opportunity to work with doctors and players of one of the NFL's most storied franchises. Keller was kind enough to discuss his journey from Annville to New York and explain his role as a member of the 2015-16 Jets' medical staff. His responses to a number of questions submitted to him by GoDutchmen.com are below. What is the nature of your position with the New York Jets? My position is that of Sports Medicine Fellow in a group called Atlantic Sports Health based out of Morristown, N.J. This is a one-year fellowship program in which I'm specializing in Primary Care Sports Medicine. In my program, I see patients on a daily basis in our office and manage sports-related injuries. My patients consist of both athletes on organized sports teams and people with common non-athletic musculoskeletal injuries. We see everything from broken bones, sprains, strains, and even concussions. Along with seeing patients, we specialize in sideline and training room coverage for organized teams. I cover several local high school football teams and I man the sideline for their football games. I also cover Drew University as well as Seton Hall University's men's and women's soccer and basketball programs. Most impressive is our coverage with the Jets. The doctors in my program are the head team doctors for the team and wherever they go, we go. I've covered training camp sessions that have seen us treating players before and after practice. I also get to cover several games and will be present on the sideline during the contest. I will also have the opportunity to travel with the team for some away games. In addition to game coverage, we have mass event coverage that includes the New York City Marathon, local triathalons, cycling events, and MMA and boxing events. Overall, our program is designed to give the fellow a wide variety of pro, college, high school, and recreational athletics coverage as a sports physician. How did you come about getting this opportunity with the Jets? I've always wanted to practice sports medicine and have been pursuing this for almost nine years since graduating from Lebanon Valley. Following graduation, I got my master's degree in biomedical sciences at Philadelphia College of Osteopathic Medicine (PCOM). I then started medical school at PCOM in 2008. I completed my residency in family medicine at St Luke's Warren Hospital is Phillipsburg N.J. My wife and I then moved from the Philadelphia area to Flemington N.J. After three years of Residency, I am now board certified in family medicine. I could practice medicine on my own at this point but I chose to pursue this specialty position. This required me to apply and interview for this very competitive fellow which I was lucky enough to receive and I am now loving this experience. How did your experience at LVC both athletically and academically prepare you for this position? Academically, LVC gave me a great foundation for biology. I originally chose LVC due to its strong reputation in its biology program. I decided late in my senior year that I was going to pursue medicine and earn my master's degree to help me fully prepare for my future in the field. I remember Dr. Allan Wolfe being very helpful and supportive in that decision. As for athletics, I feel my experience at LVC has given me a tremendous advantage over some of my colleagues. Having been a college athlete, I can fully relate to my patients. I know what they are going through, on the field as well in the classroom. I've spent most of my time so far this year dealing with football players and it really does help to have been a football player and been in their shoes just a few years ago. 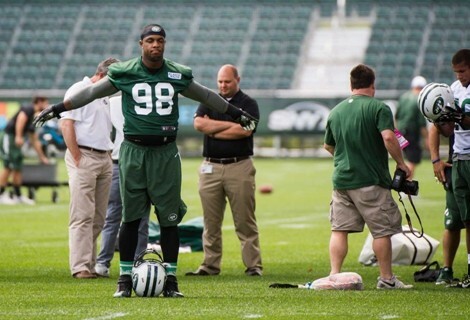 What would you like to do once your time with the Jets has concluded? Once I finish this year of training, I hope to find a job where I can continue this current type of position and work with the same type of patients in an office setting as well as sideline coverage. I hope to practice somewhere in the Philadelphia/New Jersey area. My wife and I still live in Flemington and are considering staying here. What did you learn at LVC that you were able to apply to your current position? Being a football player taught me how to work hard and dedicate myself. Being a collegiate athlete and a biology major at the same time wasn't easy. It taught me discipline, time management, and the value of hard work to succeed at both. At times, biology, chemistry, or physics labs would coincide with practice. The coaches were supportive and understanding but they did not love the fact that it caused me to get to practice late. I was one of the few players that did that but I was the only one during my time at LVC that did it all four years without either quitting football or dropping the biology major.